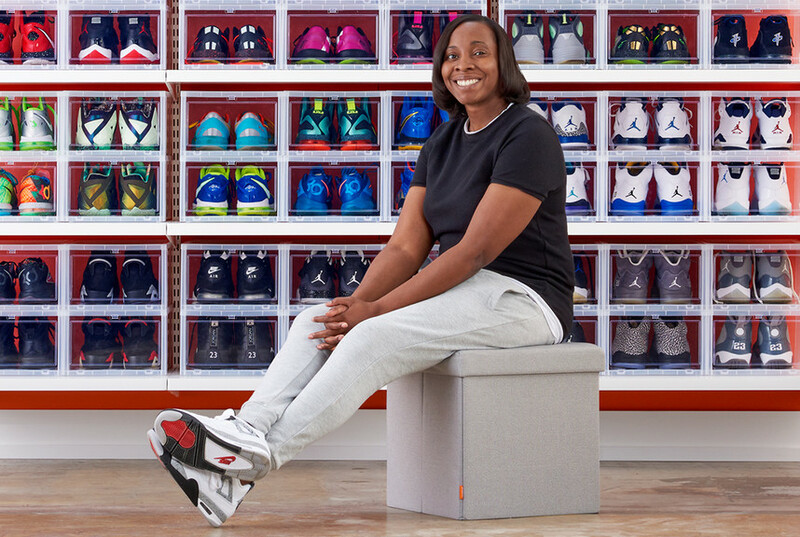 To Maggie Sauls, being a sneakerhead is more than just a term for having an enviable collection of shoes; it's a culture, a hobby and a history. "I knew I loved sneakers when I was about 7 or 8 years old. There was a guy at my church who had these Air Jordan Bordeaux 7's. He'd wear them every Sunday and I'd just stare at them the whole time we were there," she says. "To this day, I still remember all my friends' shoes from childhood - and mine too. I've just always paid attention to them. I've always cared," she says. Maggie moved from wearing a few sneakers to "collecting" sneakers in her junior year of high school. "I started collecting the moment I was making my own money and had no bills," she says with laugh. "Back then, there were no release days like there are now. I would wait on Eastbay for the shoes I wanted to go on sale. Jordan's weren't flying off the shelves then like they do now. From there, my collection grew," she continued. "Grew" is an understatement for someone with the size of Maggie's collection. Clocking in at just over 300 pairs of shoes now (crazy that we were only able to shoot 90), the selection had taken over an entire room in her apartment and two of her closets. And though she had diligently kept track of each box that corresponded with each shoe, it was time for a storage upgrade worthy of her collection. The first product to start with? Our Drop-Front Shoe Boxes. 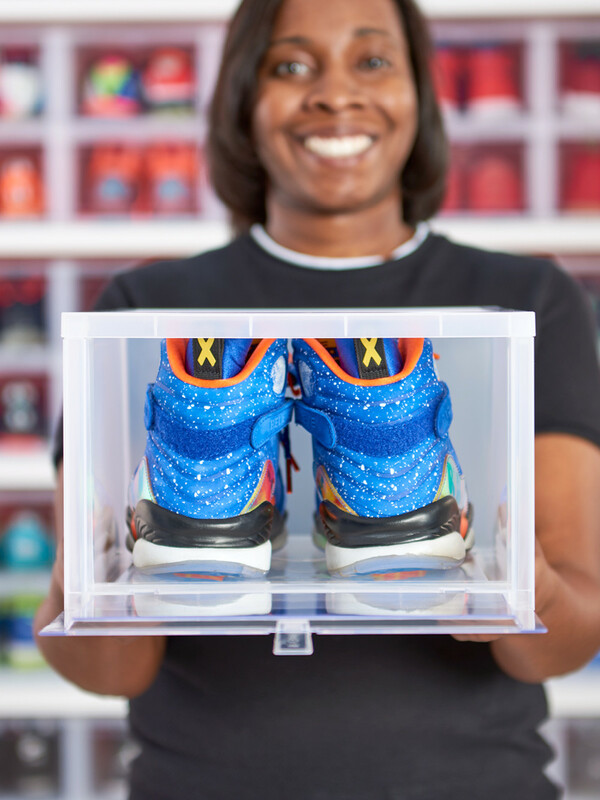 Our original mold for this Drop-Front Shoe Box has taken off with sneaker appreciators and sneakerheads alike, and it makes sense. For sneakerheads, showing off a collection is almost as important as wearing each individual shoe. 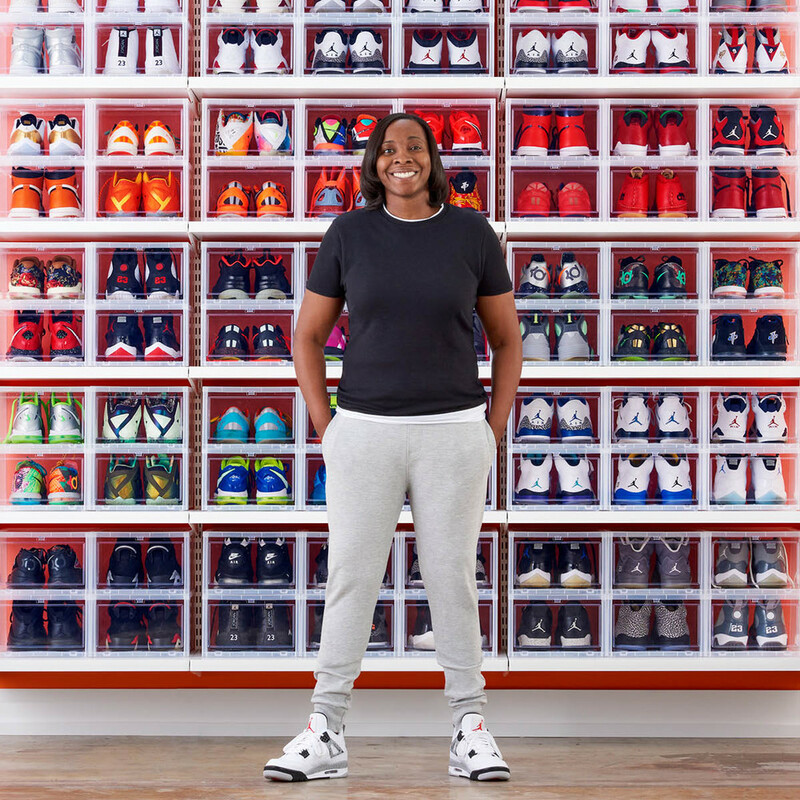 "I had kept all of my boxes with the coordinating shoes, but several of them had become dust and they weren't really working to store any of my sneakers properly," says Maggie. Several in Maggie's collection are worth well over $2,000 for a pair, even used, and dozens of them are worth several hundred dollars. Knowing that, it's obvious why there's such an emphasis on taking care of them the right way. That all starts with our Drop Front Shoe Boxes. With clear construction and a design that fits perfectly next to and on top of one another, you can stack and slide them to Instagram perfection. 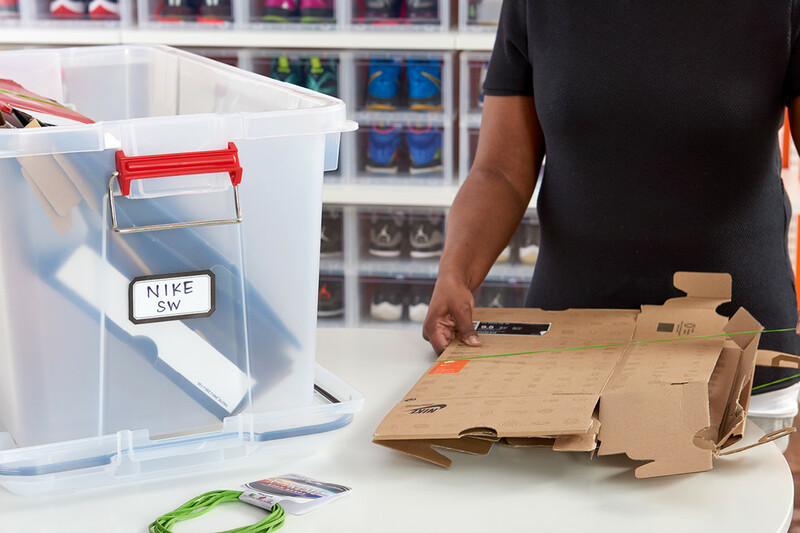 And you'll never have to worry about sliding one shoe box out of the stack to get the sneakers you want to wear - the front drops down for easy access without inviting in the dust and germs that come from open storage. An equally important part of maintaining a sneaker collection is maintaining the look of each individual sneaker. It doesn't matter if your shoes are one of one, if they're busted, dirty or even creased, they aren't so impressive. Fortunately, we have a few options to keep them clean and keep their shape like they're fresh out of the box. Sneakers are made of all types of materials. Originals were often made of real leather and real rubber, but that's not the case anymore, and because of that you need to be more conscientious of what you're cleaning your shoes with. No abrasive cleaners and no heavy scrubbing. Our The Laundress All-Purpose Cleaning Concentrate, some warm water and The Laundress Stain Brush does the trick every time - when you have time. 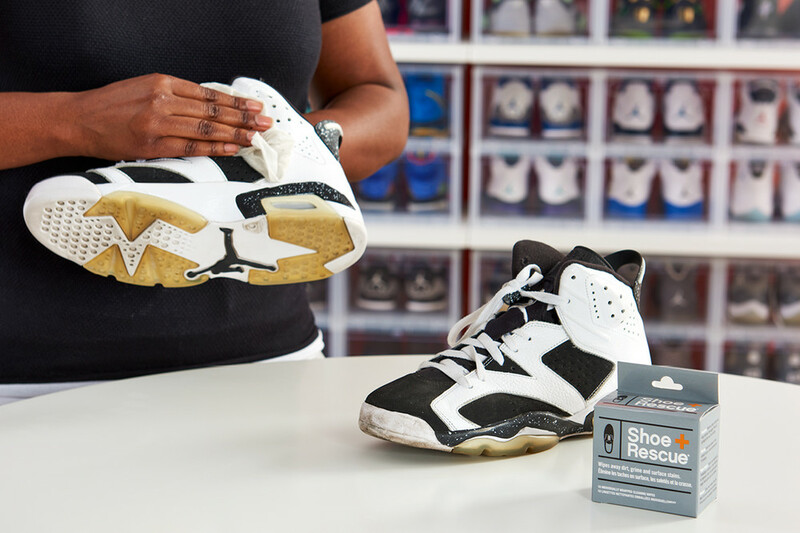 When you dirty up your sneakers on the go or don't feel like pulling everything out for a deep cleaning, use our ShoeRescue wipes. 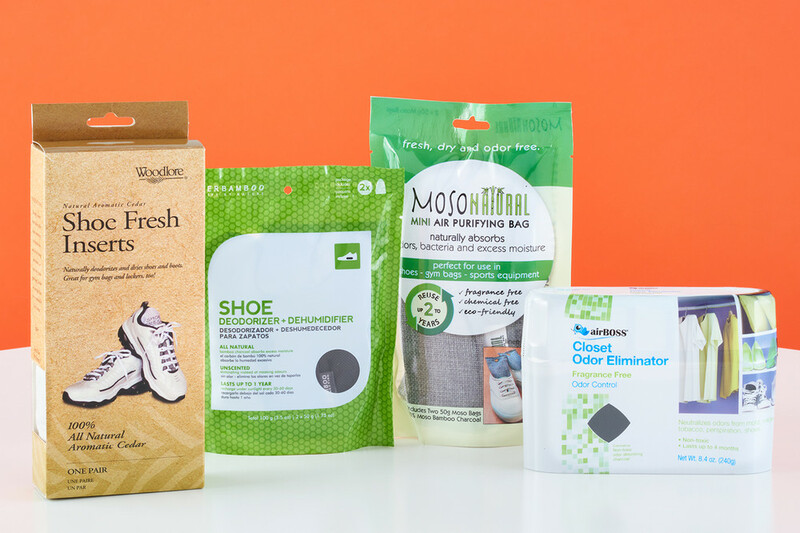 These handy, all-natural wipes make conditioning and cleaning your favorite shoes quick and easy. They gently remove surface stains including dirt, mud and grass from a variety of materials including, leather, suede and rubber. The individually wrapped wipes are easy to carry in a bag, use and throw away - and they actually work. 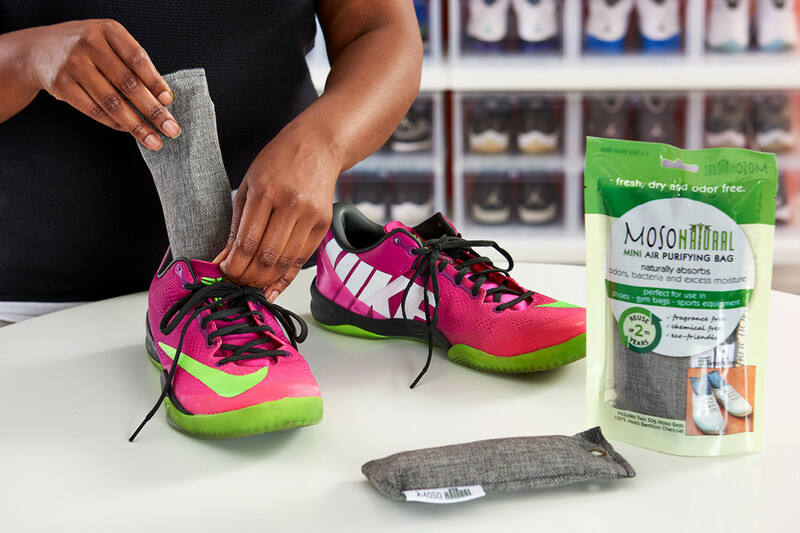 For the sneakers you actually do wear a lot, use our Mini Moso Charcoal Deodorizers. They're a naturally safe solution to absorb odors, bacteria, pollutants, allergens, mold and mildew from inside shoes and the spaces they're stored in. Within a week you'll have pure air without the need for chemicals or artificial scents because these sachets are completely fragrance free and non-toxic. The most important part of sneaker upkeep? The shape of the shoe. You want the shoe to maintain its shape if not for look, for resale at a later date. But regular wear and tear is going to happen. Ensure that you keep the proper shape of your sneakers (no creases) by using an adjustable shoe horn like our Shoe Shapes. They're made of an extremely sturdy plastic and bend to fit whatever size shoe you need to keep pristine. Original boxes are important to keep, but if they aren't holding your sneakers, they're likely taking up a lot of unnecessary room. Sneakerheads won't throw them out though, keeping an original box with the original shoe usually provides higher resale value. So, what to do? Well, each box is usually easily collapsible and can be reassembled just as easily, too. Combine boxes by brand and ensure they don't disintegrate by storing them in our Clear Weathertight Trunks. Label them with our Bordered Gift Labels, and they'll be easily identifiable when you do need a specific box again. Band them together with our File Bands so you can utilize the full interior of each tote. We have a variety of damp-ridding options for any style of storage. 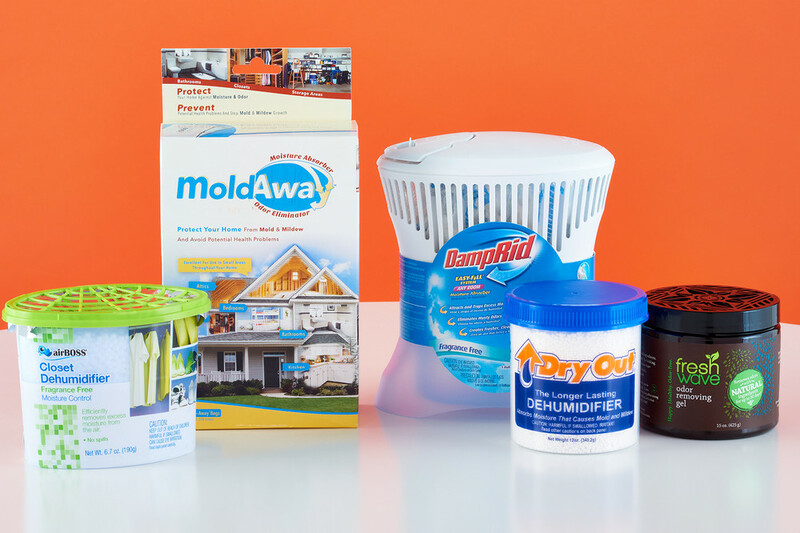 Depending on the size of your collection, we have tons of options for odor eliminators, too. When asked what her favorite sneaker of all time was, Maggie paused. "Well, I can tell you my favorite sneaker model first. The Jordan Retro III. I have every original colorway. I've always loved the silhouettes, it's the first shoe that ever showed the visible air. 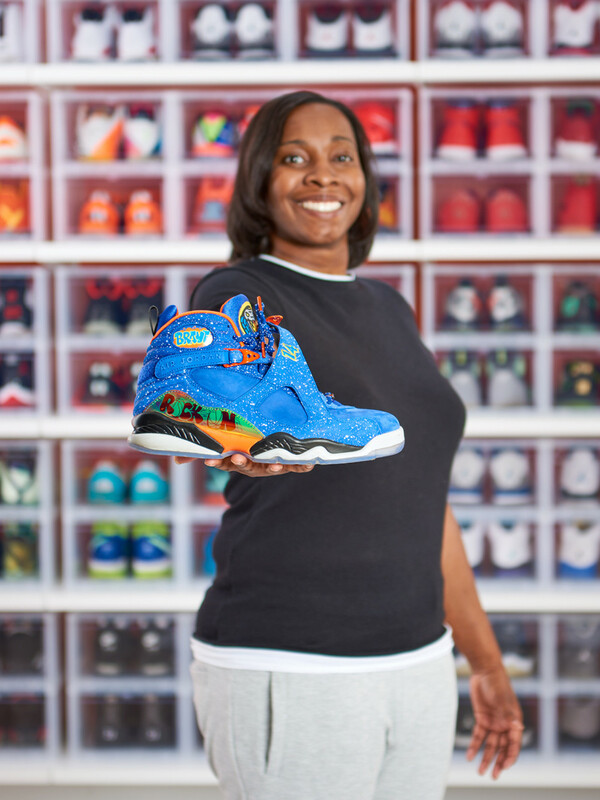 When they released, I remember thinking it was the coolest shoe I'd ever seen," she said. "But, my favorite shoe has to be the Air Jordan 11 Retro 2009 Space Jams (mint condition pairs run up to $650 resale). It was the 20th anniversary of the shoe and the Space Jam wasn't just a good Jordan to have - it was THE shoe to have, and it still is today," she continued. Sneakers are important. And we hope you can see, through Maggie's story, that they clearly mean a lot more than just something to wear on your feet. Send us pictures of your sneaker collections on your Instagram or post a few pictures in the comments below!